As attendees tweet away, the #jiconf hashtag trends on Twitter in the U.S. THANKS FOR A GREAT J/I 2017! Thanks to everyone who attended Journalism Interactive 2017, the sixth annual convening of journalism educators from around the country. About 200 people came together in College Park, Md. 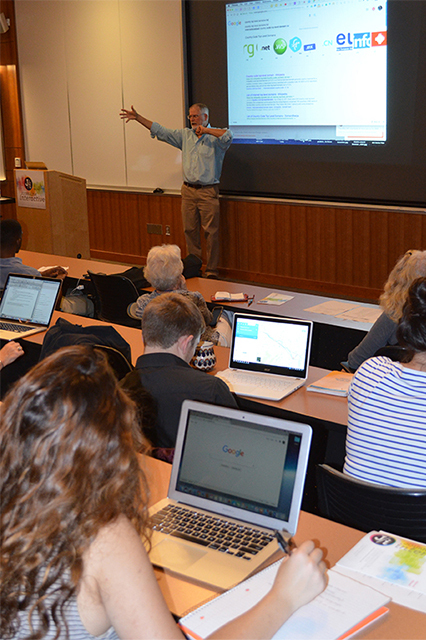 on Oct. 20 and 21 for two days of interactive media training . 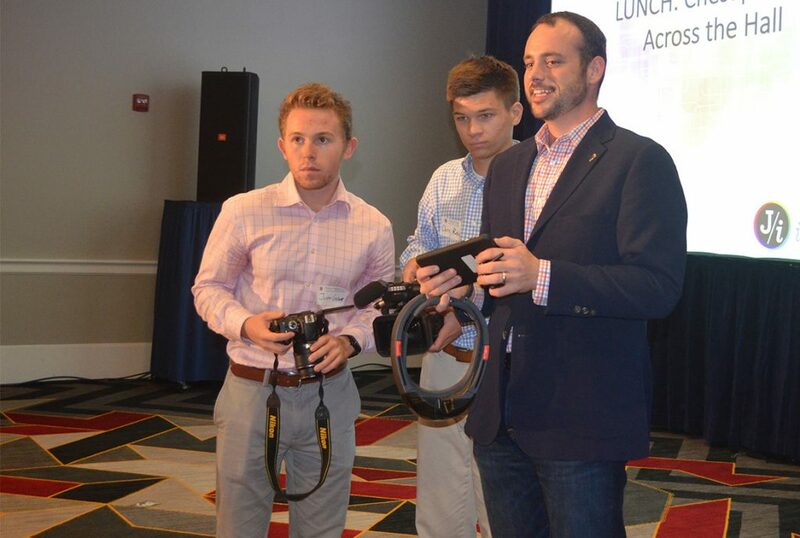 J/i 2017 was hosted by the University of Maryland’s Philip Merrill College of Journalism with help from its partner journalism schools at the University of Missouri and University of Florida. This year’s event explored the many challenges of “fake news” and the evolution of digital storytelling. It featured two dozen sessions with more than 50 speakers from news outlets and universities including CBS News, Google, ESPN, The Washington Post, Pro Publica, ABC News and BBC News North America. You can see the full session lineup on our Program page. Full-session videos from six J/i sessions are available on our Video page, along with a series of shorter, summary videos compiled by students as part of their course work at the Philip Merrill College of Journalism. 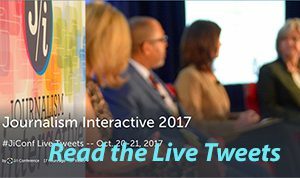 You can also see archived videos from past J/i conferences on the Journalism Interactive YouTube channel. 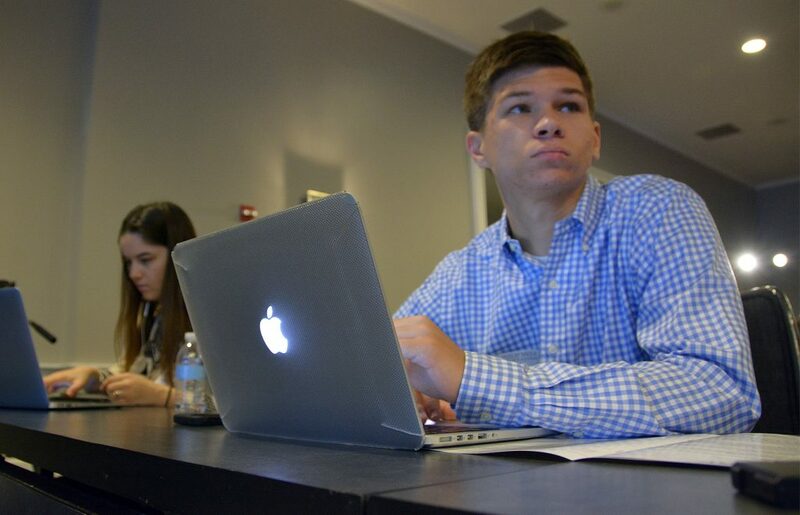 Students at the Philip Merrill College of Journalism covered many of the sessions and wrote summaries and compiled video stories afterward. Their work appears on the student newsroom page. We also compiled a Storify archive of tweets sent by attendees and speakers using the hashtag #jiconf, which trended on Twitter in the U.S. on the first day of the conference. That tweet archive is available here: Live Tweets from #JiConf 2017. L. to R.: Opening keynote with Margaret Sullivan, The Washington Post; Kevin Merida, ESPN’s The Undefeated; Julianna Goldman, CBS News; Dana Priest, The University of Maryland and The Washington Post. (Photo by Penny Caudle Lee.) Watch the full-session video here. 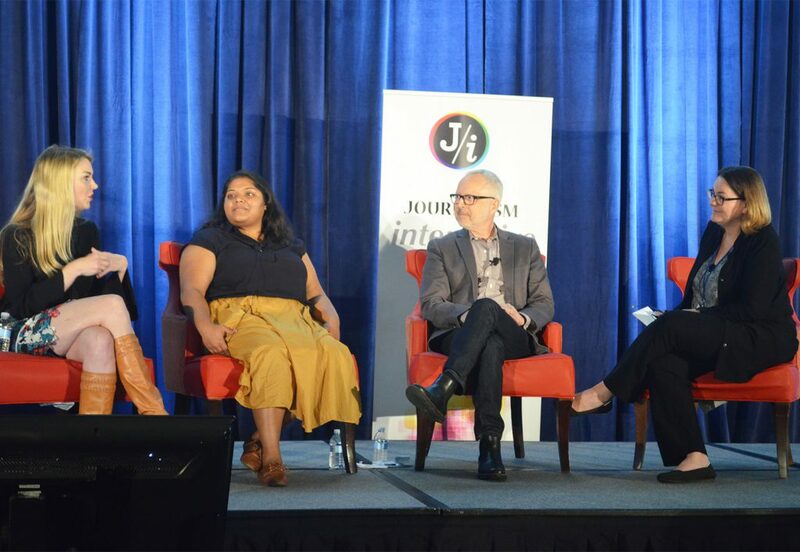 Planned and organized by a consortium of top journalism schools, Journalism Interactive has become the premiere conference for journalism educators to connect with digital newsroom leaders to share knowledge and explore how new technologies are shaping journalism education. Since 2011, J/i has provided an intimate setting for training and networking with digital journalism educators, practitioners, communicators and scholars. This year, a key theme was how journalism education is adapting to a media ecosystem in which news can be greatly enhanced—but also greatly distorted—by social media and other digital technologies. In addition to faculty at the University of Maryland, the 2017 conference was organized by faculty at the University of Florida, University of Missouri, University of Mississippi and University of North Carolina at Chapel Hill. Schools rotate hosting responsibilities each year. The Knight Foundation served as the 2017 event sponsor.